There are 3 openings remaining at this time. Letter a beautiful word of welcome painted on a prepared board to grace your entry! Choose HOME, FAMILY, BLESSED, or WELCOME in plain, milk-wash, or gunpowder finish. 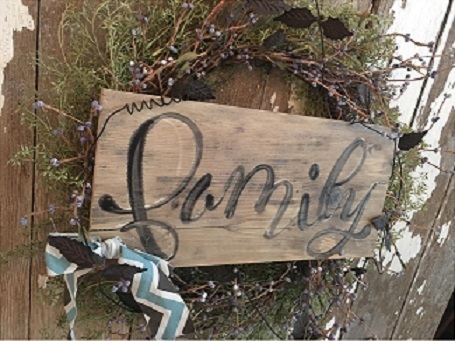 Copy artist Natalie Sorenson's friendly brush script with effortless template-assisted ease in chalk, black, brick, mushroom, or navy acrylic paint. Warm your guests with your sentiment! Materials included. Ages 14 and up. No experience necessary. Acrylics & Dessert - Holding Out for Spring!